A popular Moray summer hotspot has introduced a new parking scheme to help cover the upkeep costs. Findhorn beach brings hundreds of visitors to the region every year, and now users of the car park are being given asked to help keep it looking its best. 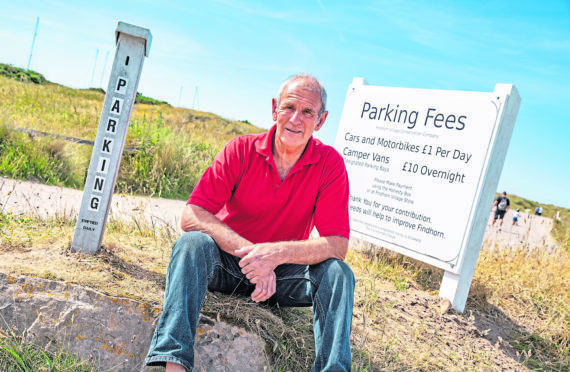 Drivers using the beach car parks will be asked to put money in a honesty box, with all proceeds going towards improvements to the beach access. Although voluntary, car drivers and motorbikers are being asked to pay £1 for the day. Campervans using the designated marked bays will be asked for £10 for an overnight stay. The new scheme has been rolled out by the Findhorn Village Conservation Company (FVCC), and chairman Frank Allan hopes tourists will understand the request for a contribution. Christine Hunt, director of the FVCC, said the popularity of the beach and the lack of parking spaces had led to this charge being introduced. “We’ve had a lot of campervans parked around the beach, and this meant there was a lack of room for buses to get past and they had to mount the pavement to get by,” she said. “With the money raised from the honesty box we can repair the car park and preserve the beach. Donald Watson, a fellow director of the FVCC said the community and tourist reaction so far had been great.